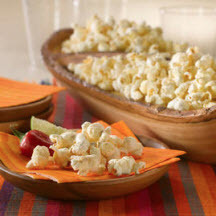 CooksRecipes has quality, kitchen-tested recipes for a variety of sweet and salty popcorn snack mixes that are perfect for parties, entertaining, movie-time—or anytime—snacking. 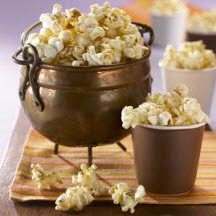 Also called "kettle corn", pop up a batch or two of this sweet popcorn snack when the munchies attack. Hot and smoky chipotle chile powder and dry ranch dressing mix team up to create a seasoning mix for popcorn that's outrageously good. 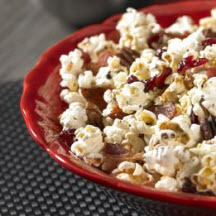 With ingredients like real, thick-cut smoked bacon, crunchy toasted pecans, dried cranberries and pure maple syrup, this sweet and savory popcorn snack is sure to be a hit.